The exintex in Puebla is one of the most important events of the textile industry in Mexico. For many exhibitors, the immense number of visitors is one of the most important criteria, and thus the most enjoyable aspect of the show. Among the visitors there are also buyers of several renowned international retailers. Many of the exhibitors from various countries and regions use the exhibition space for the four-day event. The fair attracts home textile manufacturers, designers and buyers from the textile trade, and presents bed, bath, table and kitchen textiles, wall and window decorations, upholstery materials and equipment that are required for the production of various textiles. The exintex in Puebla took place from Tuesday, 02. October to Friday, 05. October 2018. Based on many existing customers in Mexico, Suntech displayed the latest running Warp Beam Storage System model, weavers beam, batch winder. Suntech attracts many new customers from the local market as well as the neighboring countries and several orders has been confirmed at site from Kaltex, etc. 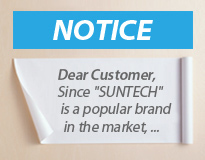 Suntech, No.1 brand in China for Fabric Make-up Machines and Material Storage & Handling Equipments.